REIFlow is a Podio Workspace that consists of 13 Apps containing over 200 fields and 30+ pre-built Automations. Each App plays a roll in the entire lead flow process. 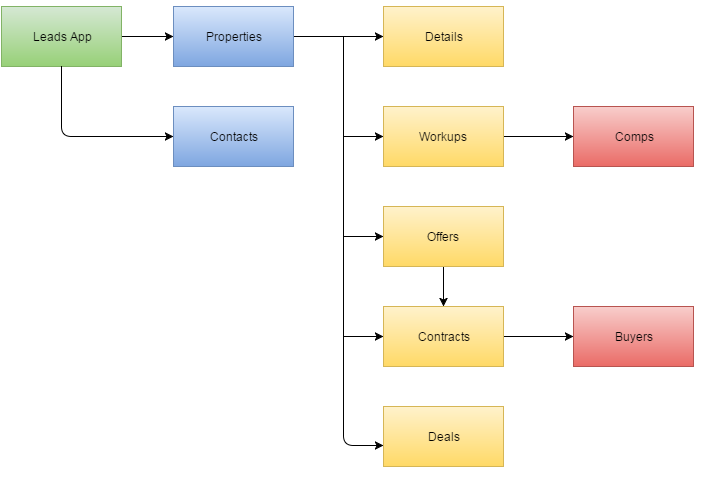 Take a look at this flow chart below to see how the Leads App is the top level and where the property, contacts and other apps fall in line. While the Leads App is the top level, the Properties App is really just a Dashboard for accessing all the information that relates to a property. Leads – The Top Level! This is where the lead takes form and is first entered into the system. Having a top level allows a single lead to have multiple properties and contacts related to it. In general this is where the basic lead information will be kept like Type, Date Acquired, Source as well as the references to the Properties and Contacts related to it. Properties – This is a Property’s Dashboard so to speak. Only the basic property information is kept here such as Address, tags and Stage. All other information pertaining to the property are stored in related apps such as details, workups, offers, contracts and deals. All that information is accessible from the Property Dashboard through relationship fields. Contacts – Your Lead Contact Rolodex. Linked to the Leads App, this is where REIFlow stores a lead’s contacts. Having a separate contacts app to handle this makes total sense because leads tend to have multiple contacts sometimes. Details – This is the property fact finding sheet. Pull this form up when talking with a seller to find out more information about the property. How many bedrooms and bathrooms, how long have they lived in the house, why are they selling and much more. Workups – The Due Diligence App. Once you have talked with the seller and have the property details, you’ll now use this app to Figure out Repair Costs, get comps, pull in zillow data, set target buyer type and come up with your Max Allowable Offer. Offers – Offer Tracking App. When making an offer you’ll want to record the Amount, Offer Date and status of that offer. Additionally you’ll be able to print out your offer letters with a click of a button. Contracts – Got an offer Accepted? Record the details here. Then start planning on how you are going to wholesale the property to one of your buyers. Set your Asking Price, pull in buyers from your list that purchase in the zip code and more. Deals – The Best App! If you are opening this app up you are smiling that I can guarantee. Keep track of the final details of the deal like profit, end buyer, date and more. I also like to get testimonials from my buyers and sellers at this point. Store those here. In addition to the 8 Primary Apps that make up the different stages of the lead flow, there are 5 supporting apps that are used. Comps – Even though REIFlow pulls in comps from zillow automatically, it’s a great idea to keep track of comps yourself. This app is linked to the Workup App and is where you will enter in comps that you find in your mls system. Task Flow Manager – This app contains the Task Flow templates used to automate the creation of tasks based off actions (create & update) throughout the REIFlow workspace. Want to create a task to call a lead after it was created? This is where you would set that rule up. Documents – Through out the REIFlow workspace, there are automations to print certain documents, this is where those document templates are stored. You may customize any of these templates to fit your business. For a full details look at each app click on over to the apps details page. There you will find a complete breakdown of each app, an explanation of each field as well as the list of Automations included with the app. REIFlow contains over 30+ automations that do everything from pull in Zillow information to adjusting the lead stage depending on what information you are entering. For a full list of the automations you can click the link below.